I was at my daughter’s basketball game yesterday. McClure Middle School vs Hamilton Middle School. If you happened to be at the game as well, I was the guy wearing vintage brown long wings. Of course. A few years back, I decided that dress shoes weren’t just for work or evenings out. Dress shoes were weekend wear as well. Prior to that, you would probably see me wearing Nikes to a game. Maybe this is a part of my aging process but I feel wearing nice shoes is approprorate for any event (there are a few exceptions – skiing, hiking, 5K, etc). During a timeout, I liked looking down occasionally and visually studying the broguing of the shoes. 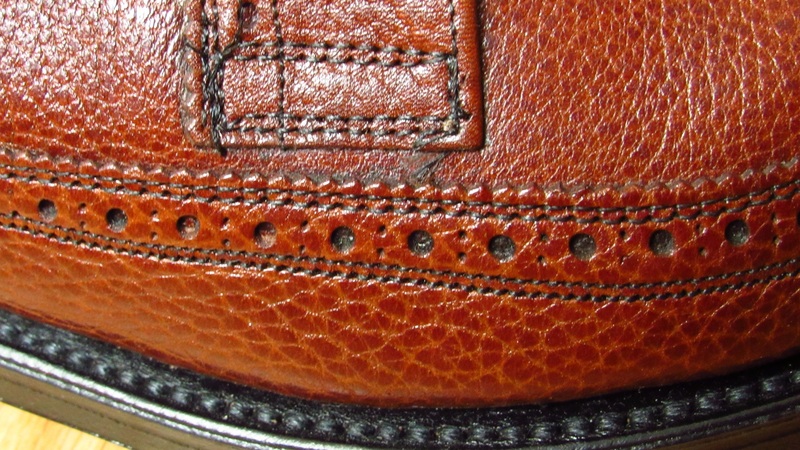 The welt stitching. But after the time out, I would get back to yelling at the kids. And refs. Kidding. Sort of. 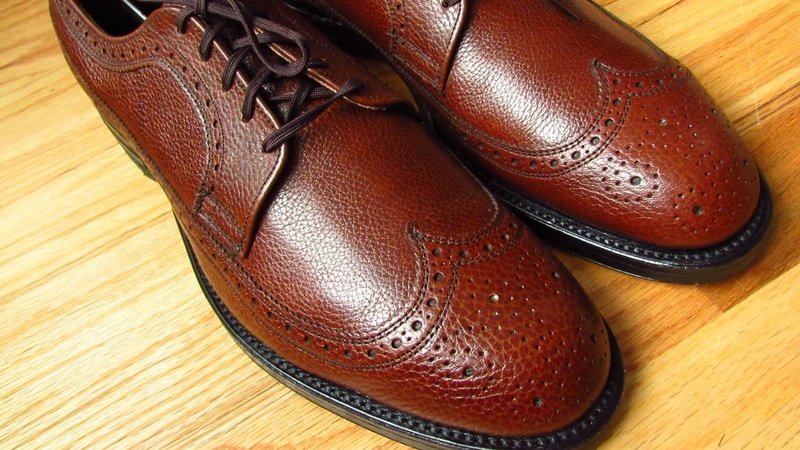 For this post, I originally was going to write about yet another pair of Florsheim shoes that I was working on last weekend. Instead, I decided to make a change and write about a pair of shoes from a vintage brand called Foot-So-Port. I first became aware of Foot-So-Port brand reading a couple Japanese blogs (actually Google translations of those blogs). I did a little research and found that Foot-So-Port was a line of shoes from the Musebeck Shoe Company. George Musebeck founded the company in Oconomowoc, Wisconsin in 1927. Like most USA shoe manufacturers, the company struggled in the 1970s and 1980s as consumer tastes changed and cheaper imported shoes flooded the USA shoe market. The company was sold twice (1979 and 1991), and eventually closed a few years after fire destroyed the original shoe factory in 1994. There isn’t much additional information on the company on “the internets”. Foot-So-Port is not a brand that vintage shoe collectors are typically searching for. eBay currently has a sparse selection of listings for the brand. I did find a few comments by some former customers that raved about the brand. They were passionate about the shoes. I believe Foot-So-Port had a very loyal group of core customers. Knapp is another less well known brand that I have read similar comments. Why were these brand diehards so euthastic about Foot-So-Port? The posts/comments all had to do with the outstanding comfort and wear of the shoes. 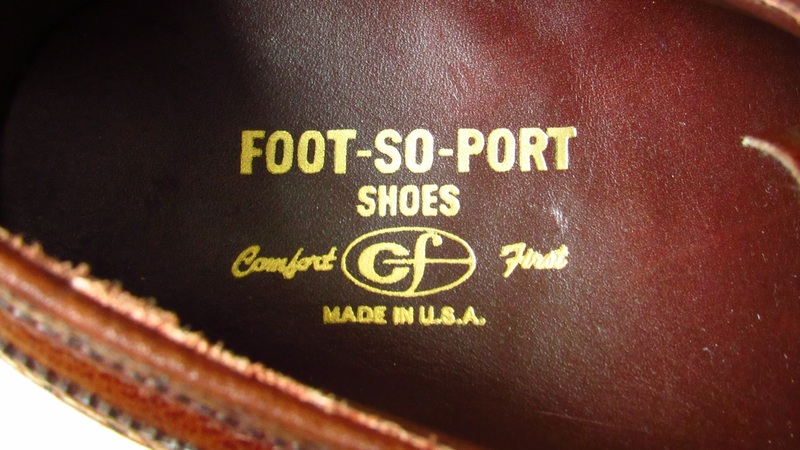 So let’s look what makes Foot-So-Port shoes different than other vintage manufacturers. The exterior style of the shoe is not remarkable and somewhat bland. This Foot-So-Port model has a fairly standard long wing design. The upper leather is made from a quality pebbled brown leather. The broguing is more subdued compared to other vintage brands. The stitching is very nice. 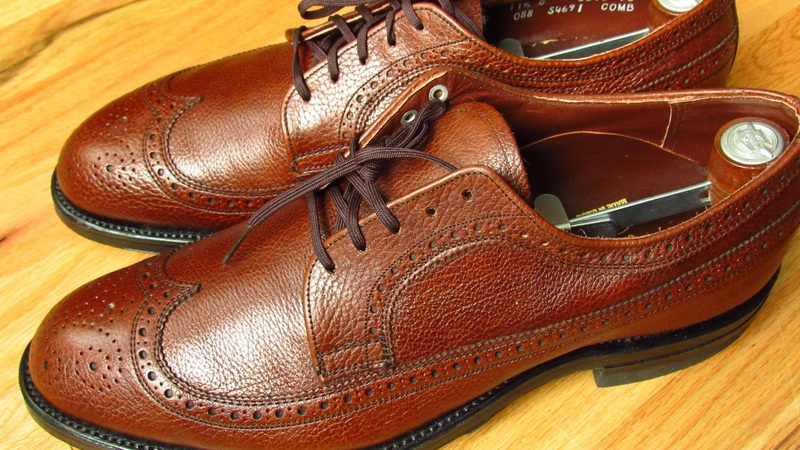 The shoes have a standard rubber heel and goodyear welted leather sole. 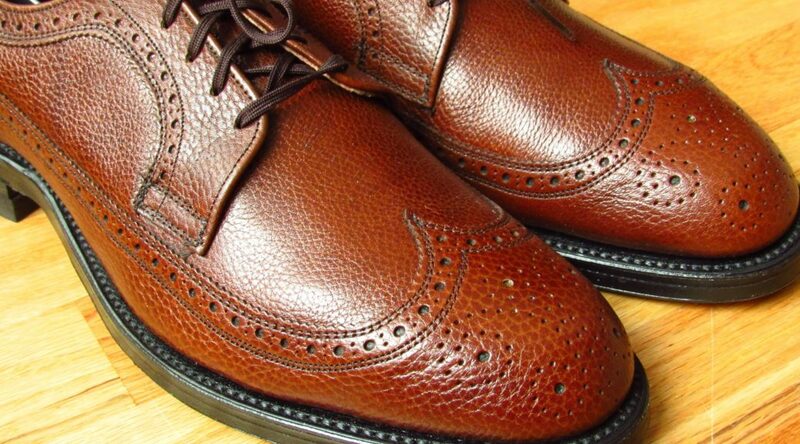 This pair would be a more handsome shoe if Foot-So-Port had added a reverse storm welt which is a feature on most long wings. 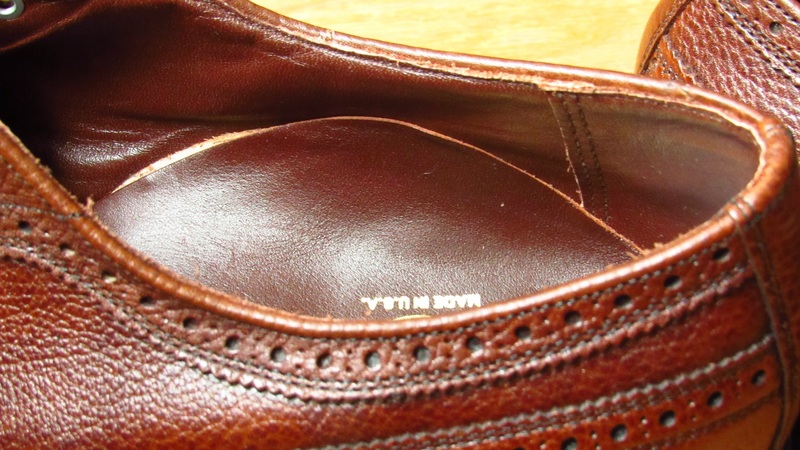 The insole of the pair is what distguishes it from other vintage shoes. The insole is large and rises to a peak near the rear of the shoe. Much further back than where there is typical arch support. When looking at the insole, it appears to show blake welting but the stitching is a actually part of patented style of insole construction. 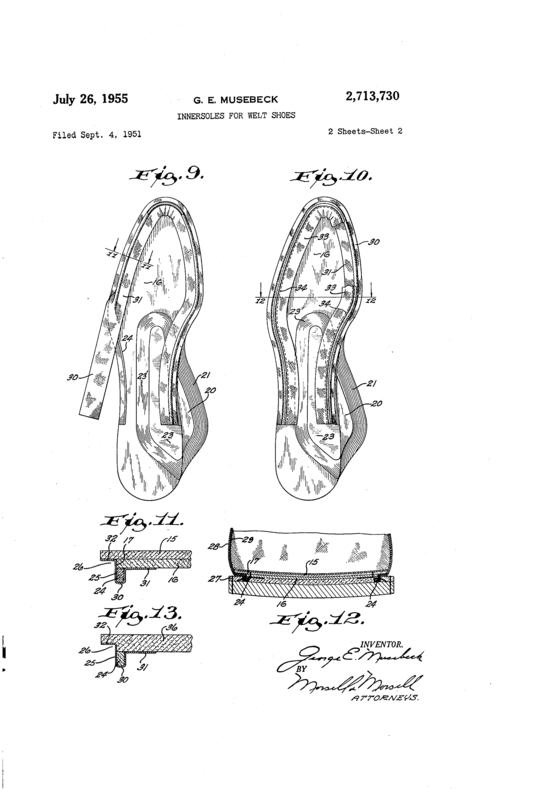 The US patent for the insole (Pat #2713730), is listed on inside of the shoe. In the manufacture of welt type shoes the bottom of the innersole must have a stitching ribl projecting therefrom to which the welt, upper, and liner are stitched during the course of manufacture of the shoe. 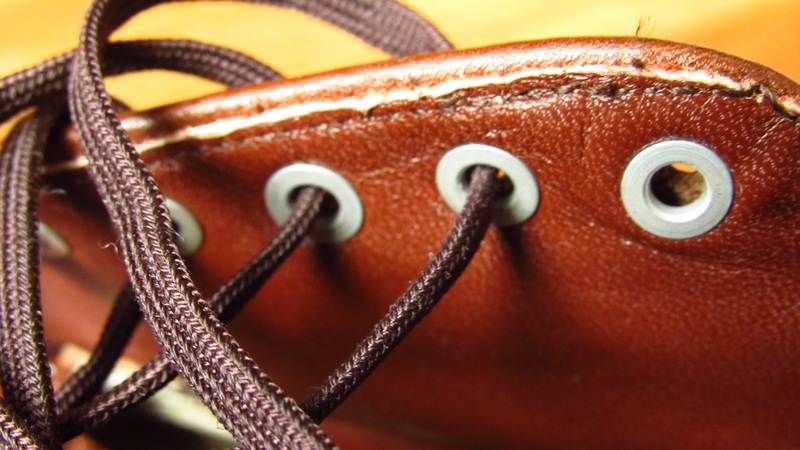 This stitching rib is usually formed by channeling the undersurface of the innersole near the margin thereof and by then bending the material outwardly to form the rib. With this arrangement, however, the bottom of the innersole is weakened along the line of the cut inwardly of the rib and is of substantially less thickness where the rib material has been bent outwardly. 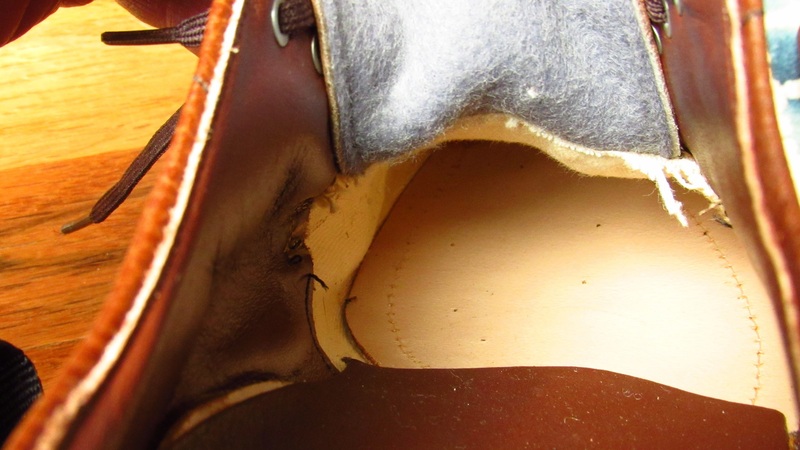 During use of this type of shoe a breakdown is very likely to occur adjacent this weakened area causing a ridge which follows along the edge of the sole around the entire forepart of the shoe. With further use, the relatively soft cork or composition filling shifts under pressure causing the foot to become improperly balanced and the weight incorrectly distributed. This results in depressions in the insole where there should be firm support and in humps in the insole where it should be smooth. As a result the foot is supported on a surface which does not conform to the natural contour of the foot and balanced tread is impossible. In addition, the ridges which have appeared press into the foot and cause pain. Due to the uneven weight distribution the foot is urged out of position causing a running over of the shoe on its outer side. All of this is an indirect result of the weakening of a portion of the innersole by cutting out material to form the stitching rib. 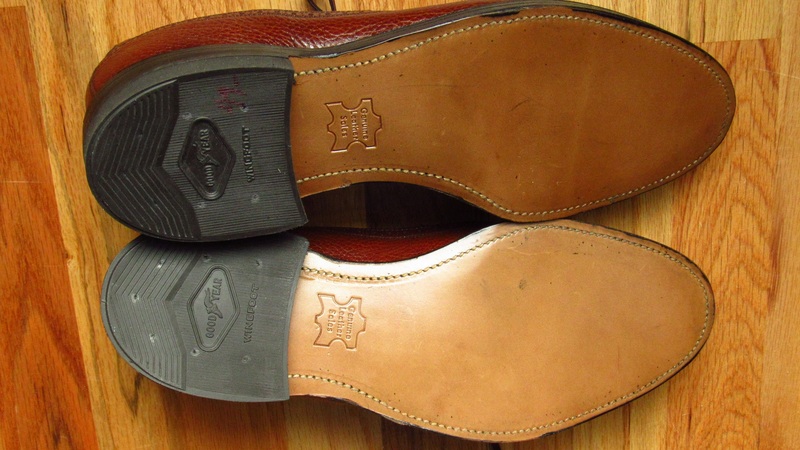 To solve this problem and make a more comfortable shoes, George Musebeck created a new type of insole that had three layers in some locations and additional cushion and support to help balance the shoe. I am not shoe construction expert but I read the patent and this was my interpretation of his invention. I have never worn the shoes around but I have tried them on in a carpeted area. They are surprisingly comfortable. The high support near the heel feels natural. I have no doubt that these shoes will wear well. I would recommend that you consider buying a pair but, of course, Foot-So-Port is now defunct so its tough to find a pair. I found this pair on eBay a couple years ago. The seller wanted a fair amount of money for the shoes. I watched them and waited. He dropped the price once over a number months and then I eventually sent him an offer which he accepted (note to buyers, eBay sellers will consider offers even if the listing doesn’t have a “make an offer” button). I might have been the only watcher. I can’t remember. I am not sure when this pair was made but I am guessing it was during the 1980s. One additional fact that I found while researching the Musebeck Shoe Company is that the company also made clown shoes using the “Clown-So-Port” brand. I do not own a pair. JSYK. And I know you were wondering if there was a pair in David’s vintage shoe museum. Below are a few more images of the shoes. Enjoy. Wow – I have never heard of these before but very enlighten article. I have just recently starts looking at vintage and have a few pair now. I spent the past weekend working on a pair of French Shriners. I have no clue about the history of them but finally worn them on my feet today!! It was a great feeling. I appreciate your information and enjoyed the read! That is interesting information. First to see if I can eventually spot a pair and then to find one in EEE. In my survey, the number ‘088’ indicates the year of manufacture. In this case, they are made in just 1980. I hope I can be of any help to you. Thank you. That makes sense. I appreciate all your help. You have been a big inspiration for me. Fascinating reading, thanks for sharing your knowledge. 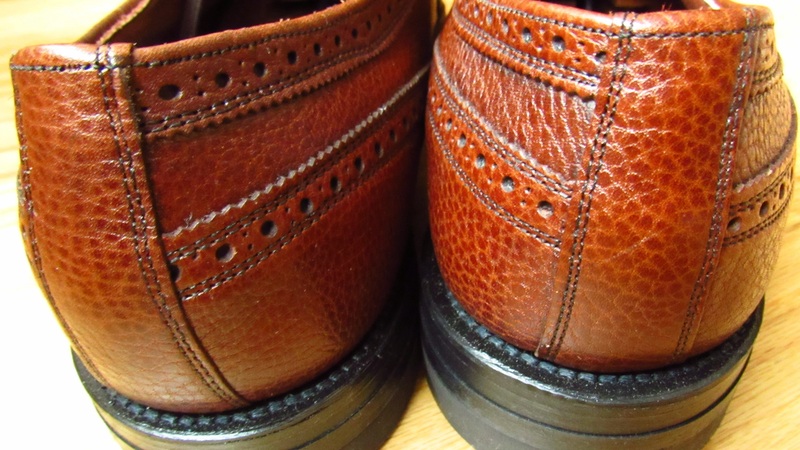 In the last photo, the sole shape resembles that of the Alden Modified last. If I ever find a Foot-So-Port in 10 C I will buy them because I know they would be comfortable. Innovative design! I have a pair by this brand in black Shell cap toes, they are very comfortable. I have high arches and very rarely do I feel support in that area. These are quite supportive. My only issue with them is the puckering along the welt of the shoe. It doesn’t seem to be a defect as it is uniform throughout. You can send me an email with photos if you want advice. My email is on the contact page. You say you recently came upon a large number of the Foot So Port shoes that had been in storage for many years. I’ve been wearing Foot So Port since I was 12. I just turned 68. When Foot So Port finally went out of business I bought as many of my size as I could find. Sadly, I’m either going to have to find another shoe or find more Foot So Ports because mine are wearing out and have been resoled so many times that it’s not going to be practical to continue to repair them. Are you able to share where you found the supply from storage that you mention so I and others might be able to see if any exist that would fit us? You can contact me at 636-236-8135 or johnr0817@gmail.com since this forum won’t publish that information. My Dad sold foot so port shoes in Springfield Mo dating back to the 1950s at Sullivan Shoe Store. I graduated high school in 1973 and began a 30 yr career in boot and shoe repair and sales. Dad held over a small stock of foot so port shoes and they by far were the best shoes of that time. They specialized in fit making sizes from aaaa to eeee in all lengths. The quality was superior and because of all the widths ( 9 in total ) their fit was unmatched if one knew how to use the Brannock device. Since they were made on a combination last no other company could fit the foot the way foot so port shoes fit. We had a loyal customer list that worn nothing else back in the day. The steel shank was triple corrugated and over an inch wide. In 30 yrs of working on all types of footwear I never saw a better one. Today they don’t make shoes to fit the foot. With most companies making medium, wide and extra wide they fit is a thing of the past. I could go on longer but hopefully this gives you an idea of just how good the FootSo Port shoe was. Thanks so much for the information. I had a hard time finding any details on Foot-So-Port. They made a great pair of shoes. 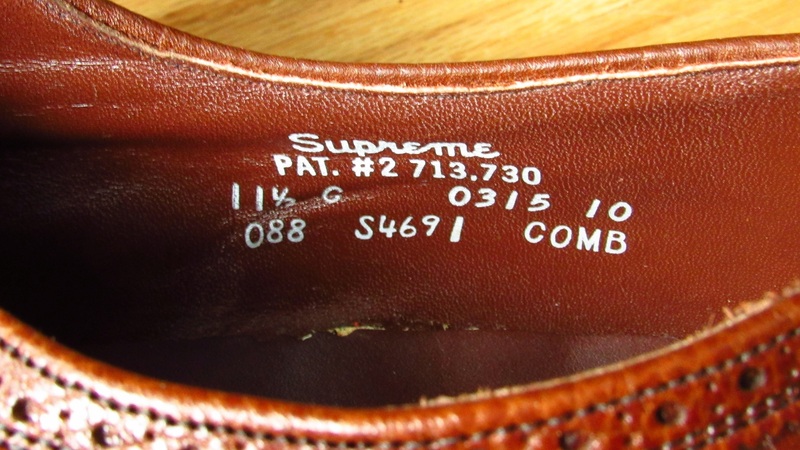 I just picked up a pair of Supreme 1/2 Brogues in 12 A/C. These look and feel like Kangaroo skin.I wear a 11.5 D normally and found they fit like like a glove around my heel and mid foot.1/2 ” long but I will be wearing these on a regular basis.These are in every way equal or above the build quality of my Alden’s.The stitching is very fine and precise.Two tone look due to the lighter and wider Goodyear welt.Very pleased, what a find.